Florence Mildred Killam, 92, formerly of Salisbury, passed away Sunday, May 16, 2010 at the Kenneth E. Spencer Memorial Home. Born June 12, 1917 in Wheaton Settlement, Florence was a daughter of the late David and Evelyn (Morton) Branscombe. She was a homemaker, a member of the Salisbury Baptist Church, the Salisbury Golden Age Club and volunteered at Spencer Memorial Home. 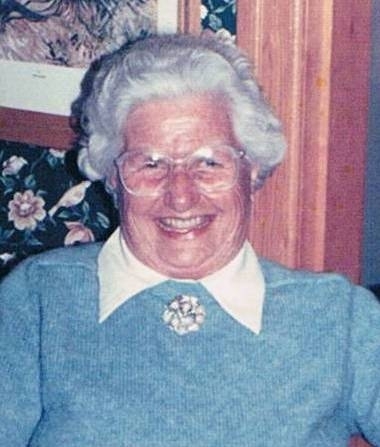 Florence is survived and missed by her daughters Kathleen Crosse of Salisbury, Becky Close (Leonard LeBlanc) of Moncton; son Ronald (Marilyn) of Salisbury; grandchildren Tanya Crosse, Trena Brown, Gregory Close, Cindy Killam, Terri Lynn Flemming and Jane Keating; 10 great grandchildren; sister Winona Wilson (John) of Wheaton Settlement; lifelong family friend Marilyn McMackin and several nieces and nephews. Predeceased by husband Arthur C.; two infants; two son in laws Bernard Crosse and Gregory Close; sisters Etta Killam and Della Hall and brothers Lawrence, Walter and Lloyd Branscombe. Resting at Salisbury Funeral Home, 3350 Salisbury Road (372-4800) with visiting Wednesday 2 to 4 and 7 to 9 pm and from where the funeral will be held Thursday, May 20 at 11 am with Rev. H. M. Lewis officiating. Interment at Steeves Settlement Cemetery. Reception to follow where friends and family will be received at the home in which Florence raised her family, Kathleen's house, 67 Boyd Street, Salisbury. If desired, memorials to Steeves Settlement Cemetery or a charity of choice would be appreciated by the family.